Dresden, once known for its beauty as the Florence of Germany, is emerging from a chrysalis of time. Overgrown shrubbery is being cleared away and long neglected homes returned to their former stately selves. The city was very badly damaged and over 100,000 people killed in a prolonged bombing attack during World War Two. 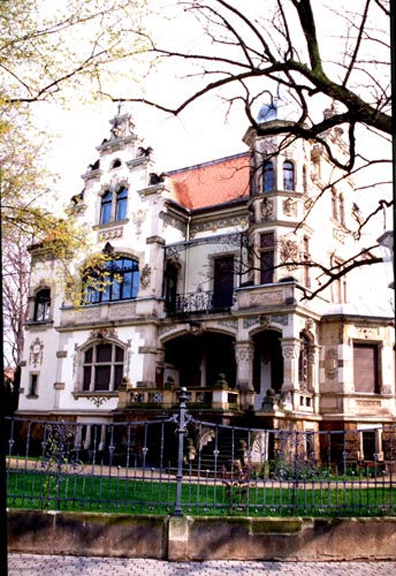 Under the communist government following the war, restoration in eastern Germany focused on public buildings and well-known mansions. Today, as the economic situation improves, more major restoration work is under way and house by crenellated house, residential jewels are being restored. Since re-unification in 1990 private capital is available to restore the hundreds of architectural gems dotting Dresden and environs. As a city in transition, much like former Eastern Germany as a whole, projects range from untouched to finished. Many large houses are sealed, windows and doors, with carefully fitted wood panels. Others stand gaping, glass broken out, wrought iron gates hanging awry in silent supplication. But here and again are the “old ladies,” buildings taken care of in the post-war years which have the comfortable look of use. Finally, beaming from tidy grounds, are beautiful old buildings, houses or commercial, that have been completely reconstructed. These homes, apartments and commercial buildings, standing prim in their apportioned space, are often stripped to their timbers. Contractors install new electrical and plumbing, build new walls and replace roofs, all the while striving to keep the original moldings, hardware, architecture, aged stone and colors intact. Homes are often sizable three-story manors with several thousand square feet of living space and substantial grounds. Large windows, turned to catch the sun, are surrounded by carvings simple and intricate, Red-tiled roofs with undulating eaves, towers square and round and pop-up dormers keep the eye roving. In Dresden, I found myself making noises at houses I usually reserved for old sports cars and armor displays. One beauty of a “house”, probably 4000 square feet, ninety-five percent restored, sits on Tolkewitzer Strasse inland a hundred meters from the west bank of the Elbe. There are still plenty of buildings painted the drab brown of communist rule, but this proud matron, subtly made up in creams and dusty rose, sits on its quarter-acre of lawn, surrounded by neat walkways, a representative of the resurgence of Dresden under an open economy. This beautiful old place was fully restored. I couldn't stop looking at it. Creme-colored stucco rises above an age-darkened stone foundation, the cruciform manor has an octagonal tower high on the southeast corner acting as a prism to bring light into the rest of the house. The lead-capped tower is set with carved faces and rosettes between windows on two floors. The base of the tower is cut away to make room for a two-story veranda and the main entrance. Alcoves bulge on two sides of the home and the lively red roof line comes to a peak at each end of the cross, then wraps around to another, thicker tower on the northwest corner. Neat as a pin, the home sits in the light, an example of Dresden’s renewal. Commercial buildings occupying corner lots point their front doors at the corner, penned off by wrought iron. From a front-gate perspective, walls and roof sweep back along the streets in a rhythm of arched windows and dormers. Virtually all buildings are of brick or carved stone, but over years of neglect, wood rot, damp, rust and weather had their way with some of the old dames. The extent of restoration can be seen by the skeletons completely surrounded by scaffolding that are in the beginning stages of restoration. The same meticulousness is apparent in city center where a huge yard of shelves holds thousands of numbered pieces of stone from the Church of Our Lady, currently undergoing restoration. Signage listing names of various contractors is prominent on both public and private restorations. There’s no shortage of work, just Euros to pay for it. Hard by the Church of Our Lady is the Zwinger, the first house of Dresden, former home of August der Starke or Strong, Elector of Saxonia and later King of Poland. Named “The Strong” for a thumb print he was supposed to have put in an iron rail and for the 354 offspring he was supposed to have sired, Der Starke was strong enough to change religions and build a Catholic church in Protestant country to get the Polish crown. A complete nut for crockery, he was weak enough to trade 600 Saxonian soldiers for fourteen East Asian vases with blue under-glaze painting, according to legend. Weak or strong, he built a beautiful suite of castles on the west bank of the Elbe, featuring a river-front promenade only recently opened to the public. This section of the city was largely restored under the communist government. 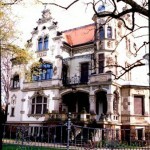 There are other royal and semi-royal residences along the Elbe. Across the river and visible from August’s promenade, stands Schloss Albrectsberg, a beautiful chateau with a spectacular view of the city center and river valley. Entering through the main portal, visitors walk through the lofty foyer and mezzanine to a garden flanked by woodsy hillsides, but open to the sun. Further south along the east bank are the dozen buildings of baroque Schloss Pillnitz, a private palace built by August and willed to his brother in 1694. The estate was remodeled in 1720 to provide him with a retreat for he and his mistresses. Remodeling was continued by descendants and in 1788 the estate became the summer residence of Saxonian regents. 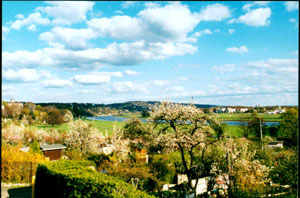 The Dresden River Valley. No wonder princes lived here. Beautifully displayed from the west bank, the Pillnitz palaces are well taken care of. The brightly painted but shuttered buildings look as though they merely await the Regent’s word to fly open with welcome. In the old days the servants arrived first, housekeepers opening and airing apartments, groundskeepers trimming hedges run amuck during the winter, butlers buying up fresh food for revelries and cooks building fires. Only at the last, ovens hot, boats painted, horses groomed and beds turned, would the Duke and his guests barge across the river to the steep-stepped landing port. At the top of the curving stone staircase, on the doorpost of the boathouses, hash marks noting three hundred years of high water stand mute testimony to the consistency of care the estate has had. The boathouse is deep in the sub basement of oneof the main buildings around Pillnitz Plaz, the flower- filled courtyard forming the center of the property. Each building has dozens of rooms, and the rest of the grounds are populated with buildings such as the Japanese Pagoda and the Orangerie, a huge hot house. Reconstruction of Dresden’s homes, like much of former East Germany, continues as capitalism slowly takes hold. Labor is relatively cheap, drawing industry, creating jobs and stimulating the economy. This Florence-on-the Elbe is re-shaping itself, adapting to new circumstances and, piece by piece, rebuilding her legendary beauty.